1. Enjoying a cup of coffee. 2. Browsing in the bookstore while doing #1. 3. Listening to the sweet sweet songwriting & soothing harmonies of James Taylor's Gorilla albumn. (This was the first record that I ever fell in love with. Yes, back then they were records. Vinyl. Albumns with cover art. Those were the days). 4. Painting in my studio while doing #3. 5. Finally killing the wasp, hornet or whatever has been buzzing around my studio. For the past several weeks, on every visit to my studio to do some painting, I have been terrefied of the wasp that would come out after I had started blissfully painting. It's hard to keep your painting mojo going when you're afraid of being stung. I'm hoping there aren't any more wasps in hiding. I'm celebrating a BIG birthday in December. At least it feels big. Not a new-decade big birthday. An end-of-a-decade birthday big. I am turning 49. The body doesn't seem to be taking it well. Yesterday I had a "procedure" to help reverse a condition referred to as "frozen shoulder". I was sedated for a short time, so the orthopedist could rotate my arm above my shoulder to break up the "gunk". Now I have daily physical therapy for a few weeks. This morning I leaned over to pick something up and immediately felt a twinge in my back. The ice pack is rotating between my shoulder and back right now. I think my body is sending me a message..."take care of me...I'm not gettin any younger". All right, all right...I get it, but I don't like it...not one bit. I have been trying to make some changes. I started a gluten-free diet about 6 weeks ago and gave up diet coke 17 days ago (yes, I'm counting the days!). I'm trying to heal my gut. It's a challenge, but it's going o.k. I like those new-decade birthdays much more than these end-of-a-decade birthdays. Turning 49 is just a reminder that I'm coming to the end of something. I may not turn cartwheels about 50, but at least it's the beginning of something new. But I guess this birthday is a not-so-gentle reminder that the body has a few miles on it and if I want to make another 50, I better take care of it. And with an occasional visit from my friend, Ms. Clairol, I will. The above picture was taken from our window one morning this past week. I love looking out at the river--especially in the morning. Right now there is lots of barge traffic. We also get to see the train go by several times a day, including the Amtrak about 8:10 each morning. It's beautiful. I'm wondering how it will change during the winter. And now for the winner...I stuck my hand in the hat and pulled out a little slip with Mindy's name on it! Hope you enjoy the package coming your way, Mindy. Thank you all for entering! I hope to have another giveaway soon! And a little reminder...don't forget that until the end of the month, 20% of the sale proceeds from my Etsy shop (www.createdbyrisa.etsy.com) will be donated to the St. Cloud battered women's shelter. It's never too early to shop handmade for Christmas! Sometimes when the dramas of life start getting you down (or simply start eating away your time), it's easy to lose sight of the many things that we have to be thankful for in our lives. The people who make our life richer. The simple things that take our breath away if we just take the time to notice them. I've had my share of drama this past month, but there's also been some pretty good stuff. Top of the list this month has to be the Women's Press issue. I've had folks that know me, but did not know "my story" or that I was an artist stop me or send me an email to let me know how much they appreciated the article. It's been so very nice. The article has made me very reflective about that difficult time in my life over 20 years ago--in a good way. Life calmed down for a moment this past weekend and as I worked in my studio I thought about all those people who had supported me through those dark days, who held me up, protected me, advocated for me and my children. There was the powerful circle of women--all with similar histories-that met every single week. We told our stories, listened to one another and held each other's hand as we cried, got angry and eventually moved on. There was my best friend (still today) whose life was on a similar course (yet miles away) that would take my phone calls any time, day or night. There were the "professionals" (my therapist, the director of the shelter, and my lawyer) who did their jobs above and beyond the call of duty. And so many more. Although it's been quite a few years since I've talked to most of these folks (save my faraway friend), I felt it was time to try to reach out to some of them and share the article with them. I also wanted to let them know that I have not forgotten how much they helped me. I wanted to thank them. I'm so glad that I did. It has made my life feel so much richer. In celebration of all my life's blessings, as a thank you for being a reader/follower of my blog, and "just cause" it's time...I'm offering this little giveaway. 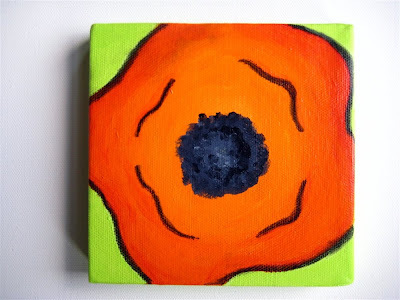 One lucky reader will win the following pictured above: a small 5x5 poppy painting (it's small but it makes me smile every time I look at it! ); a 4-pack of my photo cards featuring my artwork; a necklace that I beaded. You may enter multiple times. Here's how to enter: 1) Enter a comment on this post; share what is bringing joy to your life right now; 2) Become a follower of my blog (leave an additional comment here stating you have become or are already a follower); 3) Become a Facebook follower (leave another comment here telling me you already are or have become a Facebook follower). Hope that is simple enough. For those of you who don't have a blogger account or are new to leaving a comment, you can leave a comment by clicking the anonymous button below the comment section. I will select a winner (randomly) next Sunday, October 25th. Oh ya, be sure to leave an e-mail address, so I know how to get a hold of you if you win! This week marks the 22nd anniversary of my journey out of an abusive marriage. This is the week 22 years ago when I decided that I would no longer be emotionally manipulated, physically threatened and abused by my then-husband. I wish I could say that the abuse ended when I locked my first husband out of the house, but instead, for the next few months, things got worse. As is the case for many battered women, things got more dangerous when I attempted to end the relationship. I did all the right things--worked with domestic abuse advocates and the police. I filed an Order for Protection. And even then, things got worse. After he cut the brake hose of my car, I took my children and myself to a shelter for safety. Then I left my job and moved out of town. I moved on in my life. I put my life back together and became a stronger woman. I have also worked as a social worker and have helped other women escape abuse. And as the recent Women's Press article shared, creating art was an important part of my healing from the abuse I endured so many years ago. In the past few years, I've been working on a series of paintings that had their beginnings in the artwork that I first created following my divorce. 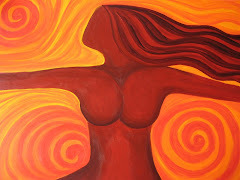 I've titled the series Womanspirit Revisited. 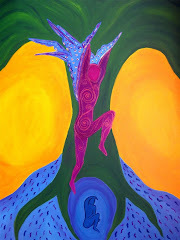 Force of Nature, the painting featured on the cover of MN Women's Press is one of the painting in the series. I exhibited this painting and two other paintings from the series at the recent Art Crawl. This is the first time I've shared the painting Grace In Sorrow (I'm sharing photos here). I created this painting last winter. The words that I added to the woman's body are my own words about my own experience--it was written years ago for court. I know it is powerful--even difficult to view. I shared it with the encouragement of my loving, supportive husband. It was interesting watching the reactions of those who looked at it. The words on the body, not readable from a distance, drew in the viewer. Quite a few commented about how powerful the work was. One man had a hard time hearing that it was indeed my personal story--even when I told him it had happened over 20 years ago. (This is part of what I hope people think about--this type of thing happens to people you know. Some women don't survive--like the Minnesota woman who was recently murdered by her abuser when she tried to leave). Sharing my story, through words or art, is no longer painful. I share it with the hope that it will have an impact. I share it to honor my experience. I share it with the hope that it will encourage other women...that they will feel the courage to move on, that they will not feel alone if they have faced similar experiences. And I share it to celebrate the power and courage of women everywhere. And sharing this work was a powerful experience for me. I feel encouraged to continue on with this series. Someday I hope it will be its own exhibit. I think it would be very powerful. Our front door, with the new "car door magnet" I ordered from Vistaprint! The door color is a much deeper purple. Small paintings just outside the door. Just inside the door. The hallway into our studio creates a little gallery perfect for hanging paintings. The opposite wall of the entry hallway (actually closet doors) complete the entryway "gallery". The primary wall in our dining room/gallery. Me with the Women's Press cover and original painting. One of the display tables I had set up for the crawl. And finally, more paintings that I hung on the wall outside the studio. The Fall Art Crawl has drawn to a close (just in time for a 2-3 inch snowfall here in St. Paul). I'm exhausted and still recovering from this extremely busy weekend. It was, as always, an invigorating and rewarding experience. I have a lot of thoughts about the weekend, but need a little more time to rest and absorb it all. In the meantime, I wanted to share some photos showing how the studio was set up for the Crawl. So there will be more thoughts later, but for now--a BIG thank you to everyone who came to visit my studio during the Art Crawl. I enjoyed spending time with everyone! The Fall Art Crawl has threatened to turn into the Winter Art Crawl...morning temperatures were below freezing this morning and there was a blanket of snow on the grownd (now gone it seems). But it's warm and toasty in our studio--so much so that we had the windows open throughout the day. Turnout to the Crawl has not been the greatest this year, but it was steady throughout much of the day. Sales are also not setting any records. But more importantly I have been blessed with many visitors, including family and friends. The Women's Press article certainly brought in additional traffic and initiated lots of dialogue about my work. It always feels good to hear positive feedback about your work. We've also had an interesting number of visitors who have previously lived in the Tilsner--including one woman who lived in our very unit 10 years ago! There's one more chance to catch the crawl--our studio, along with many others--will be open from 12-5 on Sunday. It's been a long day and I'm ready to head to bed. Hopefully tomorrow I'll have pics from the Crawl. It's late...the Art Crawl is set to begin in just about 18 hours! Joel & I are scurrying about--hanging artwork, arranging furniture, finishing all those last-minute tasks. This will be our first time open for the Crawl at our Tilsner studio/living space. We hope lots of people will come visit our space! --Park for free at the Broadway/Kellogg lot. --Then select a few buildings to begin your crawl experience. I recommend starting with the Tilsner (300 Broadway Street) where I'm located (Studio #507). The Tilsner is located across the street from that free parking lot I just told you about (see how that works!) Generally I suggest checking out some of the buildings that are live/work spaces (like the Tilsner) and buildings that are solely work spaces--like the Jax. The Jax has a high concentration of open studios--many of the artists have been open there for years. I still have a working studio at the Jax. --Buy a crawl catalogue for a small donation ($2, I think). It contains a nifty map of the crawl, artist information, and a picture of one of my pieces (along with work of other artists). --Wear comfortable clothes and walking shoes. You will be doing a lot of walking and after a while, comfort takes priority over fashion. --Although you won't find a meal, you will be offered plenty of treats. Some studios even serve wine. --There will also be music and performers in some studios or outside buildings. You'll find the most street entertainment on Friday night. The Black Dog Cafe usually has a fire juggler on Friday night. There are even things for the kids to do. Outside The Depot there will be a tent set up where kids can work on a mural. Mears Park has some children activities scheduled. The Tilsner has a full line-up of music. You can find the listing here. --Feel free to chat with the artists. They open up their studios so you can learn about their work and because they would like to hear what you think. Anyone who knows me knows that my life has been a bit of a rollercoaster ride at times. Fortunately I've learned to ride the rollercoaster well! A few weeks ago we had a scary time with my stepdaughter in the hospital. She recovered fully and life got back on course in time for me to enjoy the excitement of the Women's Press article. As I was enjoying that high and preparing for the Fall Art Crawl, the rollercoaster got running again...with a really scary "drop". This past weekend my 22-year-old son was mugged and viciously attacked. I got one of those middle of the night phone calls that every mother dreads. At 4:30 in the morning I was racing across town to get to the hospital. The weird part is that I had woke up at 3 a.m. with a sense of something being wrong. I believe in mother's intuition. I spent some scary hours at the hospital while they determined the extent of his injuries. Ultimately he had some deep cuts sewn up and was sent home with me to begin the healing process. He still may face some surgery to repair some orbital fractures (eye socket). The healing process is emotional as well as physical. I have a feeling that the physical healing may be easier. It's hard to make sense of it all. How do I help my son feel safe in his world again? And honestly, parts of me want him to stay a little scared so that he will be more cautious in the future. We had a discussion today about how growing up as a woman I quickly learned not to put myself in vulnerable situations, to always have my guard up. I know that my daughter has already learned this. Sometimes I think that young males, with their false sense of bravado, are in more danger. Even though my children are "grown" I still want to protect them from harm's way. I still live in fear of the middle of the night phone calls. I don't know how to make that fear go away. So my preparations for the Art Crawl this weekend have been slowed considerably. Some things will simply not get done. (I'm still determined to finish those Seasons paintings) I know it will be fine. And I will enjoy this rollercoaster ride again. It's been a good week...still riding the high from the MN Women's Press coming out. It's a thrill to be out and about around town and see my painting on the cover! Today back to the studio to keep working--still trying to get this series of painting done in time for the crawl next weekend. Here are some updated pics. Basically I'm at the point where I need to finish up by working on these ladies' lovely faces...not my favorite part! But I am enjoying working on these--something very different for me. It's good to challenge yourself sometimes. I am learning lots as I work on these and lots of new ideas are flowing from this work. Usually I am so wiped out following the crawl that I take a break from painting. I hope that this year I just keep working. Maybe I need another deadline or show to work towards. Actually I do, because my Jax studio will be open in November for Lowertown First Friday! (Studios throughout lowertown are now going to open on the first Friday evening of each month) And I am on the prowl for a show somewhere new. In my spare time (ha! ), Joel and I are busy getting our studio/living space ready for the crawl. Joel is doing the last of the wall painting. We are both tidying up. Soon we'll start hanging the artwork. The Art Crawl is only a week away!